Life is funny isn’t it? You live your days as it comes, not caring about the world. Then suddenly one day you meet this person and you can’t imagine your life without him/her. People normally say, “The moment I laid my eyes on you, I knew you were for me”. I am sure this is how most of your story starts. But for me and AS it was a bit different. I better start from our history to give you a clear picture. I first met AS in high school. To be frank, I can’t remember the first time I saw him or talked to him. We had 52 students in the class and he was one of them. It took me a while to remember everyone’s name. Over time, I started hanging out with a few friends all the time and he was in this group. We got to know each other slowly but always in a group. Our school used to organise hikes every few months. Most of us would go and so did me and AS. Also our group used to go to the library, restaurants and tuition as well spending lots of time together. We rarely spent any time alone but I remember walking with him back form the library a few times. We went to each other’s houses as well along with other friends. I remember having lunch at his place once, which was cooked by his mum. At my place he now teases me that I served him under cooked Wai Wai (instant noodles) for lunch. At that point of my life I was a tomboy; M who loved the company of boys more than girls. It’s not that I hated girls but I had only 4 female friends and I had many male friends. I liked him as a friend but never in a million years had I thought of him more than a friend. There are few reasons why it never crossed my mind that AS could be anything more than a friend. He was a nice guy who studied really hard and did well in class. He was always there when I needed some help and I used to like his smile. But he was a soft spoken shy guy which is the opposite of loud voiced me. I was extrovert and he was introvert to sum up the difference. But I really liked his smile. Years after school, if someone talked about him, I could still remember his smile. So our high school ended and we went our different ways. I came to Australia for further studies and AS went to India for his engineering. We used to email each other may be twice a year and most likely that email would be initiated by me. I liked to keep in touch so I would email a few friends just to say hello. In most cases, he wouldn’t reply for more than 6 months. Then suddenly he would pop out of nowhere with a few line in an email. Then when I reply to that email, he would disappear again. I used to get really annoyed by his behaviour but I accepted him the way he was. 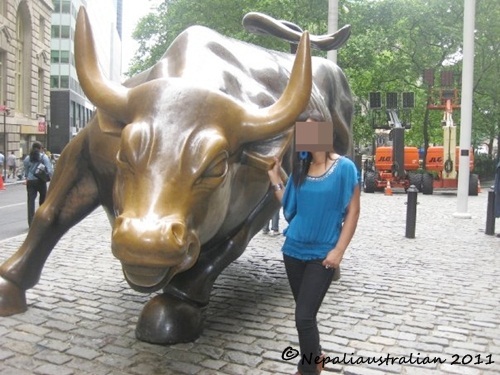 Every time I used to go to Nepal for vacation from Australia, I used to email my friends about my plans to check if any of them were coming to Nepal during the same that so we could catch up. In most occasions either AS will just have left Kathmandu when I got there or would arrive just few days after my departure from Kathmandu. So I didn’t meet him at all for a long time. I am not sure if you remember Hi5 which was popular before Facebook. I had an account there and had invited all my friends to join me. Many of my friends did and to my surprise AS did as well. But even though he had an account; he never updated it so it was kind of useless. Our life was going on as normal 1000 miles apart. I basically had no ideas what he was doing but he had some ideas as he later told me he used to check my Hi5 account from time to time. After my graduation, I started traveling whenever I could. One of the trips I made was to the USA. When I decided to go on holiday to USA, I planned my holiday so I could meet as many friends as I possible there. By this time AS was in LA. So once I booked my flight, which was 6 months before the travel date, I emailed all my friends there telling them the dates of my flight. I asked them if they were free during my stay in USA so I could plan accordingly. Many friends emailed me back and I start making my plans according to that. But as you may have predicted, AS didn’t reply back. I was really annoyed as I considered him a good friend; it would have been good to catch up with him. The day before my flight, I was checking my email and to my surprise, I saw one from him. Seriously, after more than 5 months, he was replying to me. I am in LA these days and here is my number XXXXXXX. Please call me when you get here. I was really annoyed with the email as I could imagine his smiley face typing those words. Anyway I saved his number on my phone and waited for my holiday to start. It was a long flight to the US but I was really excited as it was my first big trip. I had a friend picking me up in LA and I was staying with him and his aunt. He and his aunt had made many plans for me so when I landed in the US, I didn’t call AS straight away. There were so many things to do and see that the time flew so two days before I was to leave LA I called him to check if he had anytime to meet me before I flew out. We couldn’t work out a time that suited both of us so I flew to Baltimore without meeting him. From there I did my planned trips to Pennsylvania, Niagara Fall, Toronto, NY and Florida. I didn’t have any hope of meeting AS because on my way back to Australia, I had only 12 hours in LA which I was planning to spend in the airport. I didn’t want to complicate things by by going out. Around the end of my holiday, AS called me up and asked my schedule in LA on my way back. I told him my plan. I was a bit annoyed with him that he hadn’t met me. I told him if he really has time, he can come to the airport as I won’t be able to travel to where he is. I was half expecting him to say he was busy but he said he would come. I was glad to have some company during my stopover. After having an awesome time with my friends and family, finally I landed in LA. While walking out from the terminal, I was thinking that I didn’t have a mobile phone so if AS didn’t show up (which was quite possible) as we had planned I would be alone for more than 12 hours in the airport. I had my laptop with me so I planned to surf the internet to kill time. I came out and went to collect my baggage. I saw my bags coming out and was about to take the bags from the carousel and those bags were super heavy. I had done so much shopping that I was having a hard time lifting my suitcase. Then there he was. YES, AS actually made it to the airport to meet me. And he was there helping me lift my bags onto a trolley. This entry was posted in Nepal, Our Story, Relationship and tagged Florida, my hubby, my love story, Niagara Fall, NY, Pennsylvania, Toronto. Bookmark the permalink. Oh waw I was away and you wrote so many posts, but my favorite is going to be this the story of you and AS. Aww so far the story is getting beautiful..I can’t wait to finish this comment and jump to next posts. You are so lucky that you don’t have to be in long distance love at all. Believe me it is really worst and hope I didn’t have to go thought that. It is only nice at first then gets annoying when you can’t see each other for months. Every now and then it is nice to look back… through pictures, through memories. I hope to tell these stories again and again to my kids and grand kids . More the merrier. Bring them over gal. I am sure you will have at least few kids by then 🙂 Take care. Thank for dropping by. Hope you will visit more often. :). Part 2 coming soon. Super excited for part II…. Wow…very interesting…look forward to part II. Is he crazy??? God lord…I would have taken a much more aggressive approach even if I have introverted tendencies….hahaha…but apparently he knew what he was doing…cheers to AS!